Cory Ricker, head brewer, pours a beer at 2 Feet Brewing Co. in Bangor on Nov. 18. A guest takes a photo of his flight of beer at 2 Feet Brewing Co. in Bangor on Nov. 18. 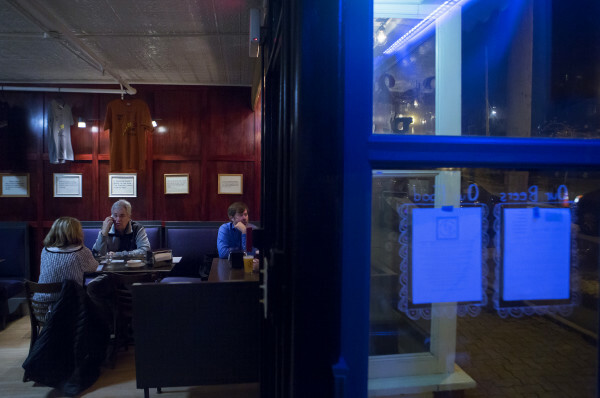 Patrons enjoy food and beer at 2 Feet Brewing Co. in Bangor on Nov. 18. Cory Ricker, head brewer, shows off the brewing room at 2 Feet Brewing Co. in Bangor on Nov. 18. Cory Ricker (center), head brewer, talks with guests at 2 Feet Brewing Co. in Bangor on Nov. 18. 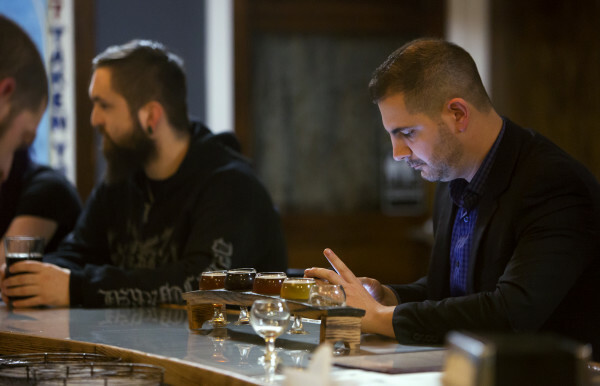 Cory Ricker (left), head brewer, waits for an order at 2 Feet Brewing Co. in Bangor on Nov. 18. A few years ago, Hampden residents Cory and Nok-Noi Ricker found themselves daydreaming about making a personal interest into something they do every day. Cory Ricker’s homebrewing hobby became an all-consuming obsession, and Nok-Noi Ricker began traveling around New England with him to homebrew expos, brew fests and other beer-related events. The more beer they brewed, and the more people tasted it, the more they began to think: Could we open our own little brewery? 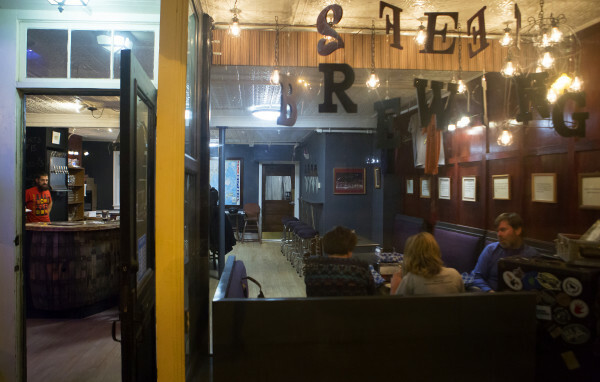 After all those years of dreaming and scheming, 2 Feet Brewing, the couple’s new nanobrewery, last month opened a tasting room at 80 Columbia St. in downtown Bangor, offering up a rotating selection of beers brewed by Cory Ricker and his brewing and business partner, Jerry Robichaud. There’s also a small menu of simple, tasty comfort food, concocted by Nok-Noi Ricker, and beer lovers can take home growlers of Robichaud’s and Cory Ricker’s wide array of brews. 2 Feet Brewing — so named because the Rickers liked the active, playful sound of the words — is a unique beast among the Bangor region’s rapidly growing beer scene. Cory Ricker, an eclectic, creative brewer, is not interested in just one style, one approach, one aesthetic when it comes to beer. If he wants to make a Belgian-style Saison flavored with ghost pepper, he’ll make one (and he did, with the spicy-but-not-hot Barn Burner). An English Strong Bitter? He did that too, with Riker, so named because it was their first beer brewed, an homage to “Star Trek: The Next Generation,” as Captain Jean-Luc Picard referred to Commander Riker as “Number One.” The Banana Bread Weizen Bock is an early customer favorite, and yes, it does taste like banana, though no bananas were used. If the beer tastes good, anything goes. Cory Ricker has been homebrewing for more than a decade. 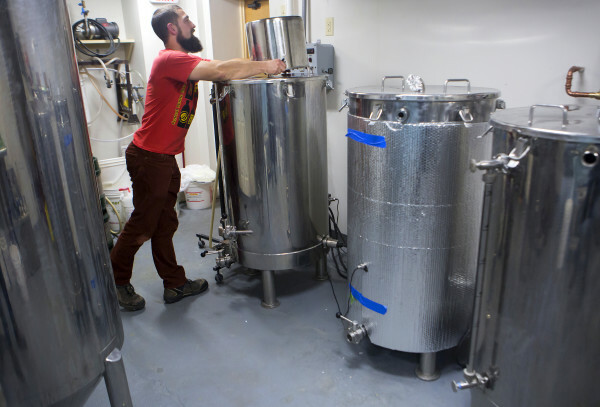 He started very casually, at first, but eventually was brewing with greater frequency and with a more experimental flair once homebrewing mecca Central Street Farmhouse opened in downtown Bangor in 2010, bringing with it a greater variety of brewing ingredients. As breweries like Orono Brewing Company, Geaghan Brothers and Airline Brewing opened, and popular downtown beer bar Nocturnem Drafthaus flourished, Cory Ricker found himself inspired by their successes. Once the couple made the decision to go forward with a professional brewery, they began immersing themselves in the byzantine state and federal laws for opening a brewery — and the hunt was on for a location. They knew they wanted to be in downtown Bangor, or at least adjacent to it. The Columbia Street location, formerly the home of Vapeway, a vape shop, and, before that, the dining room area of Montes International Catering, was the only spot that had everything they needed. The Rickers and Robichaud spent the summer renovating the space — a long, curved bar was hand-built by Robichaud, and retail display platforms in front of the windows were taken out to allow for more seating space (2 Feet can seat 39 people). Cory Ricker and Robichaud began brewing in early September, in their basement brew house. The second week of October, 2 Feet opened its doors. That very same week, the City of Bangor began a large construction project to replace old sewer lines on Columbia Street and adjacent streets, so since opening day, dump trucks, workers and piles of gravel have been occupying the street directly outside their front door. “One thing we’ve learned is to not open your brewery the same week construction starts outside your front door,” said Robichaud. 2 Feet’s tasting room also offers a simple menu of small plates, inspired by the many appetizers and other treats Nok-Noi Ricker has made in her home kitchen over the years. Her sweet and spicy chicken wings, deconstructed Maine lobster rangoons, curried deviled eggs and cheese and onion enchiladas are ideal beer-accompanying snacks — not too fancy, but hot, fresh and delicious. In a few weeks, beer pretzels made by local eatery Fork & Spoon will be added to the menu, made with brewing grain supplied by 2 Feet. 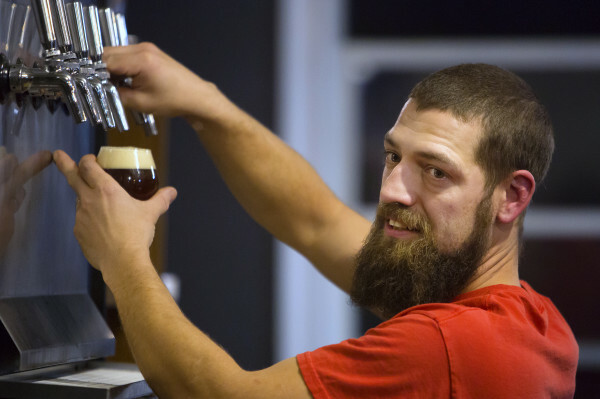 Though 2 Feet Brewing opens at 3 p.m. seven days a week, the couple intends to keep their day jobs (Nok-Noi Ricker with the Bangor Daily News, Cory Ricker as a master electrician) while being in the bar as frequently as possible. 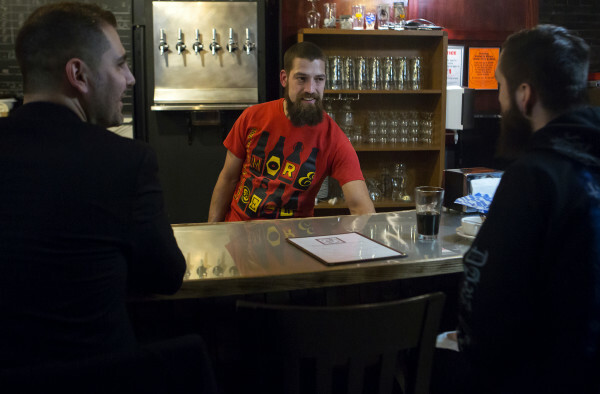 Nok-Noi Ricker’s 23-year-old son, Zak, works as bar manager, and Robichaud also can frequently be found pouring pints. 2 Feet Brewing is open from 3 to 9 p.m. Sunday through Thursday, and 3 to 11 p.m. Fridays and Saturdays. For more information, visit www.2feetbrewing.com.